It's not Lyn, but a blue armor. Could he fill the gap in your armor emblem? 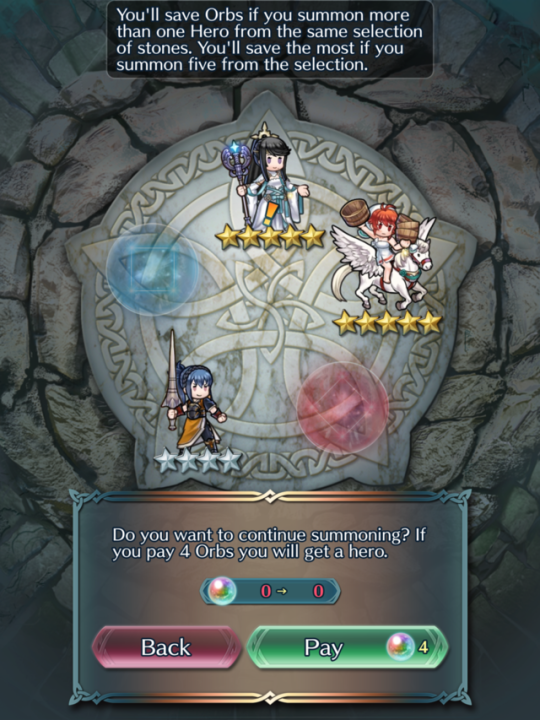 Sorry you got your pity rate broken, but congrats on that great unit! +ATK can never be bad. I... I... I don’t know what to think of this. I like Celica and she’s a fantastic +spd/-def but I really wanted Valentines Ike merge to get rid of that -def. +SPD Celica is great, I can tell! Congrats! (Sorry you didn't get Ike, but -DEF shouldn't be bad on a fast unit like him). He might work even better with my new team, actually, though I can’t be sure yet. But a strong unit with dual-phase doubling potential and built in distant counter sounds pretty much perfect for my goals. I just need to see how well I can tweak his atk to be exactly equal with Ike and Ephraim so they all get Eirika’s bonuses. Continued to pull on the Valentine banner and got yet another pity breaker - Nailah! Waiting until next month, though, so I can pass on DC and Null Disrupt (I think that's a triple skill thing, anyway). Darn, 4 unit banners are making everyone's pulls a bit painful I see :( Sorry to those being pitybroken or with high rates. Well after deciding I won't go beyond the first summon/tickets for the new beasts banners, I was impatient and used more orbs for the elusive Flying Sakura. It might have gone up to 4.5%, I didn't check because I was being frustrated how only 1 colourless orb would appear each time. ...in the end, I got a Hoshidan healer..
Sakura's mother Mikoto....which I am okay with! She's +Atk/-Def which works out really well, and any new 5 star is welcome. I decided to open green anyway just in case I can fix my -Spd HS!Hinoka and voila, I can't believe I got another one! She's +Atk/-HP this time as well, so she came with the same boon as her mother! Didn't have enough orbs to try the others but with 2 +Atk units I can be content with this ending. Maybe I'll do a final YOLO in the banner end but I'm pretty much done with this banner, don't have much orb reserves left (karma for the free summons last week?) and I had to start doing Blessed Gardens for a quick 10 orbs for this. I still want an emergency fund for Halloween Mia's return (really like her weapon). @NegativeExponents- Wow, nice B!Celica! My V!Ike's -Def as well and to be honest, it's not too much of a handicap. Refining a sword for +4 Def is one way to fix it. I saw a very good Felica build with the bucket, killing all meta dragons. Wouldn't waste precious fodder to fix a minor bane. @mcsilas ooh see that is so the danger of me and getting more HInokas. Yeah, I’m taking this as a sign I should give up on Valentine Lyn for now and focus on the upcoming beast banner, where I’d mostly be happy with any of them. I am frightened for my luck. I just pulled Mist with a 3% pity rate and Sakura number 3 in ten orbs. 83 to 29 orbs. +Spd, -Hp to boot! Though I do Buttercup as her voice actress. Now I just need to spend tickets on red orbs. Used the free summon and one Ticket, came out with neutral Keaton. I’m quite happy with this, as Keaton is someone I wanted but figured would never come home because Red pool would deny me. Woohoo! Now to hope the remaining tickets bring in Kaden and/or Velouria! Spent 140 my orbs to get a Keaton, Velouria, Sumia and Leif. Pretty good even if they have -_- natures. Hey, congrats! I got a Sumia after four orbs and now I'm not sure I dare to continue. She keeps haunting me with her scary art. I normally do a full pull on every New Heroes banner, but my freebie summon ended up being a spare Karla. The exact same nature as the one I alreayd had too, +Res/-Def. I don't really have a compelling use for her. I'll do my full summon once the forging bonds event grants me one of those tickets. I've only got 400 orbs so I'm not sure I dare to; I keep telling myself Cynthia is right around the corner. Can't waste orbs on swole warewolves. I got a random Maribelle. She is neutral, and even though I’d rather fodder her, that staff valor is the most useful valor skill to have, so I’ll use her for the SP grind on my 4 star healers for a while. These were (from left to right) just my second and third circles. Velouria did get that damn Atk flaw (+Def/-Atk), but I think I can live with that when Tibarn and Greil got Atk assets. Kaden, meanwhile, got an inoffensive +HP/-Def. Given how long it took to just get Tibarn (and none of the other three) on the laguz banner, you could say that I'm quite happy right now especially with getting Velouria already. Oh, green orbs hell I can't say I missed you. which color isnt hell with the amount of heroes present and it being a 4 man banner! While I did get the beasts... dear god now that I think about it, it was just like the last Beasts banner to, where I got ALL the off-focus summons. Hell, not only did I get a +HP -Spd Adrift Camilla to overwrite the +Def -Atk one I've had, but I also got the last two Owains needed to +10 merge him, with one of them being +Spd. While that is among others, the main meat and potatoes are the beasts. Unfortunately, they all NEED a merge because their Flaws were awful... except Keaton. He was the pretty alright all things considered +Def -Spd, but he got a merge anyways on accident, while I was still able to get another Keaton to give one of the Herons Beast Valor. Anyways, Kaden originally had +Def -Atk, Selkie originally had +Spd -Atk, and Velouria originally had +Res -HP. Selkie ends with +Spd -Atk but a merge to overwrite the flaw, Kaden ended with +Atk -Res with a merge, and Velouria... I'm actually still sniping for. EDIT: And new Velouria get. The following are the final results of this summoning. ...GAH this never gets any easier does it? On a summon Ticket I got a Ryoma. Ok?